If you’re designing (or redesigning) an outdoor living area for your home, there are three design elements to consider: protection, comfort and style. How to fuse them all together is where the headaches start for many ‘homeowners-turned- exterior-designers’. The wrong setup can be an entertainer's worst nightmare - picture: uncomfortable guests surrounded by inadequate, dilapidated furniture, frying in the sun. With this guide, we’ll help you design a space that you'll be proud to entertain company for hours in. Here's what you need to know in order to design an aesthetically pleasing and functional outdoor space in your backyard. Let’s start with a checklist of the important elements of what makes an outdoor space functional. What’s the reason why you want an outdoor space? Is it to spend time with friends and family, or to have your own private oasis? Will you want to lay down and enjoy the garden, or is it also for dining? Think about what worked and what didn’t in previous experiences with living areas or gather inspiration from hotels and resorts you've stayed in. Is the area south-facing? Is it attached or detached from the house? And is the space limited by walls or other structures? If the shade moves during the day, for example, a cantilever umbrella (where the pole and the base are placed outside the canopy area) will allow you to adapt quickly and easily. Is the space just for the summer months, or are you planning to use it all year round? What will the weather be like during that time? You'll want to start thinking about fabrics and outdoor accessories that suit your desired seasons. How much room do you have in your yard and how much of it do you want to occupy? Ideally, you should leave enough free room for other activities, or simply to walk around the garden. The shape of the space is another important factor. If it’s square or rectangular, it will be easier to organise. But if it’s long and narrow, then the shape, size and arrangement of the furniture will deserve particular attention. The outdoor living area should have its own style, but overall it shouldn’t be too different from the rest of your home. A good outdoor space often transitions seamlessly from inside, out. When you consider budget, you have to ask yourself how much are you willing to spend? Once you have the budget figured out, however, it’s about deciding how to spend it. Here, we caution cutting corners. Looking for cheaper options is not always a good idea, and there are some elements of an outdoor area that you shouldn’t compromise on quality. For example, high-quality umbrellas that won’t fade or break at the first gust of wind are an important feature of every outdoor space. Designing for Airbnb: If you want to use your house as an Airbnb, the quality of the furniture is particularly important. You need furniture and shading solutions with fast opening, easy-to-operate mechanisms and robust enough to survive less-than-ideal guests. Also, with quality products, it's easier to get that 'wow factor' that makes the difference between getting a top-grade review (and more visitors as a result) or not. Now that you know what aspects to consider to make a space functional, let’s create one. With contemporary materials and design, you can find products that will satisfy both aesthetics and functionality. Consider what activities will take place in your space. The comfort of being in the shade hardly needs to be explained. One thing you must keep in mind, however, is that blocking out the sun won't automatically save you from becoming sunburnt. To be really protected, fabrics must come with a UV filter. Shadowspec umbrellas, for example, come with nearly 100% UV protection, are water-repellent, mould-resistant and colour-fast. 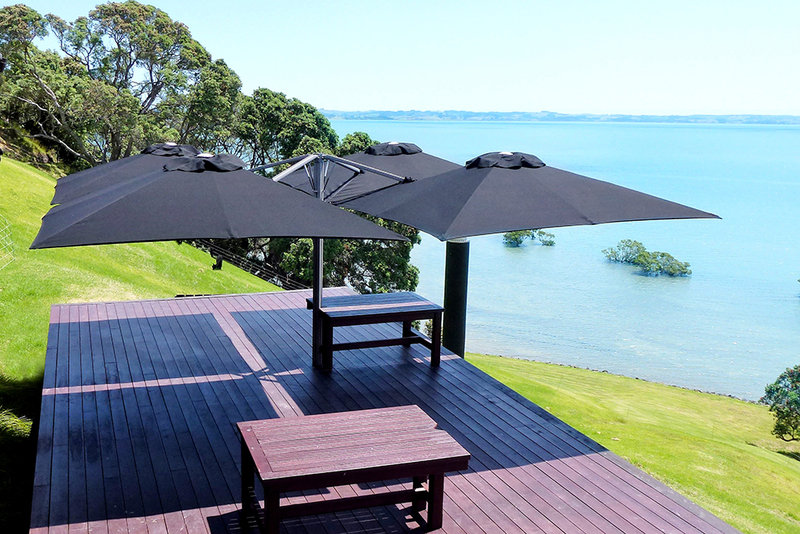 Cantilever umbrellas add even more versatility, as you can easily rotate them and move around with the shade. It will pay to opt for quality shading solutions. Because, you may have purchased an outdoor umbrella, but if you didn't invest in a quality one, you could be sacrificing comfort and style. 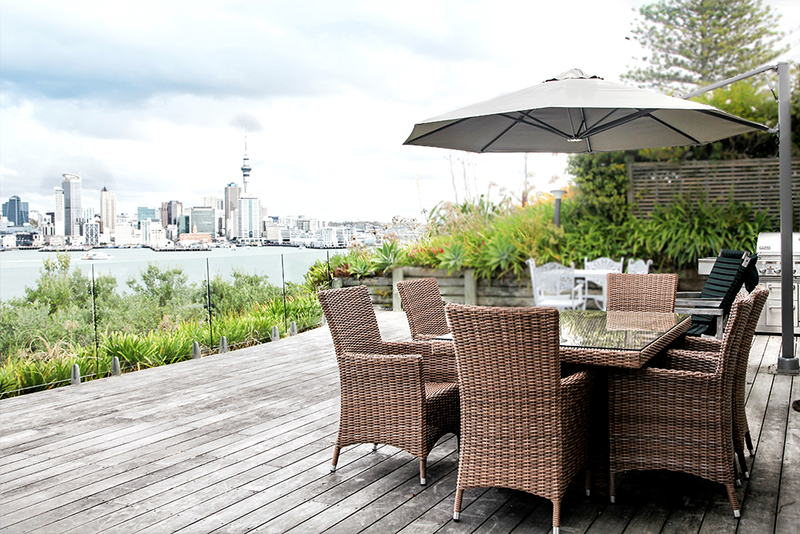 The table is the centrepiece of all outdoor dining areas. It's where family and friends congregate and memories are created. If that's the type of space you're going for, then it's worth investing in good quality materials that can withstand the elements and intensive usage. Gone are the days when outdoor chairs had to be uncomfortable to be outdoors-proof. You will be amazed at how far outdoor living furniture has come in terms of style, comfort as well as durability. If you’re planning on using the outside area during the warm season, then a fireplace will easily become the main attraction for your guests. For a dining area, a barbeque is the evergreen choice. As we said, the style of your outdoor area should be consistent with the interior. That, however, doesn’t mean an exact replica. So be bold with it and don’t be afraid to add some unique decorations. No matter where you live in the world we’re all at the mercy of the elements. When designing an outdoor space it's good to build in flexibility so you can put things up, take things down, and move things around to get the best out of your space and investment. 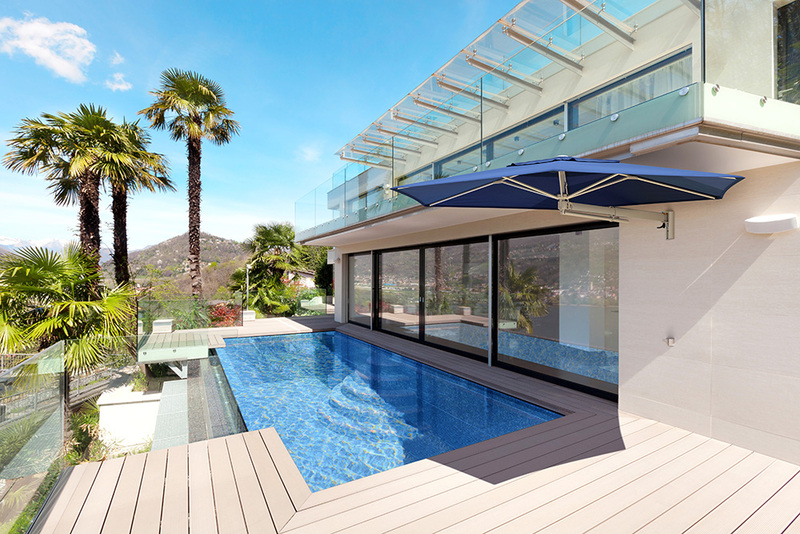 Cantilever umbrellas are just one example of how far flexible shade can go in adding comfort to an area. Shade moves and the weather changes, so a permanent solution is not always the best option. 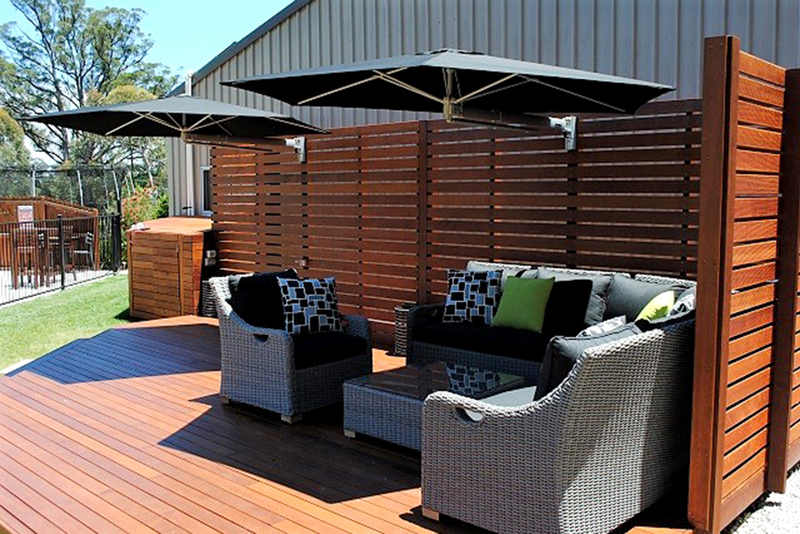 Here you have a list of the most popular ways to create shade in an outdoor space. Outdoor umbrellas. 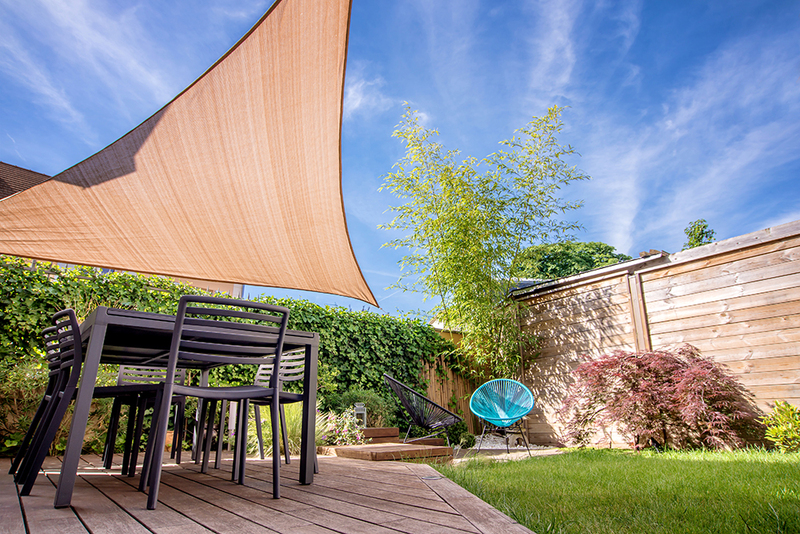 Umbrellas are a very popular choice because they offer all of the benefits homeowners need. They’re stylish, flexible and provide 100% UV protection while remaining very easy and cost-free to maintain and can last 10 years or more if you purchase a quality solution. Shade sails. They're similar to ship sails but they're suspended horizontally overhead. They’re typically rectangular, but you can play with different shapes and overlapping effects. They have a geometric style of their own but are quite inflexible, are permanently erected and are also costly and difficult to maintain. Awnings. When they’re equipped with retractable arms or an electric motor, they're quite practical to use, but come with a few disadvantages: they tend to be pricey, motors can be temperamental, and the retractable arm can buck around in the wind and bend or even damage the mounting to the wall of your house. Pergolas. These are permanent structures topped with open rafters. They look good, but may not be the best solution if you need full shade. They also need regular re-staining or re-painting to maintain. Louvre systems. These structures function similarly to interior blinds, but are mounted horizontally over your area and they are usually made of aluminium. Despite looking good, they are the most expensive shade system available and are mostly quite inflexible. They also can be a bit full-on to maintain and can give issues when leaves/water mount up in their guttering and mechanisms, particularly the retractable and rotating louvre systems. Vertical and retractable screens. They protect from angled sunrays and provide additional privacy. With the retractable option they can be lifted when needed. A good basic protection from low-angle sun, but they do require a permanent structure to mount off. Gazebos. They’re similar to pergolas, but with a roof. Classic gazebos (those you see in many public parks) are octagonal. However, for private spaces the shape is often rectangular and can take up a bit of space. They are a permanent structure and may also require council/county permits to construct. TIP: Check out the quality of your umbrella - DIY assembly is required for even our top of the range products! Designing the best outdoor space for your home can be frustrating if you don't have any previous experience: there are so many aspects to consider, products to evaluate, and so many possible mistakes to make. That's when the advice of an expert supplier can be a great help in creating exactly what you want to achieve with that space, especially when you're shopping for a shade solution. Your umbrella is an investment - and as such should come with the security that it’s going to work in your home - particularly as they can be customised to what you want it to be - you’ve got the ability to work with a sales consultant to create exactly what you want to achieve with that space. It’s easy to know when you’re talking to a qualified consultant: he or she will ask several questions before offering a solution and provide personalised recommendations and suggestions. They won't just try to sell you the most expensive or the most popular product but will determine the best products on the market for your case. This person is more than just a salesperson at your local furniture shop. A true shade consultant will make sure you are buying something that can be installed easily and won't break as soon as the first rainstorm strikes. The first step in designing your ideal outdoor area is to have a clear vision of how you're going to use it and consider all the different aspects beforehand: location, purpose, weather elements, and of course budget. After that you will need to determine exactly what type of furniture goes into that space, striving for three things: beauty, comfort and functionality. There's no need to accept compromises: if you choose good quality products you can easily have all of them. An essential moment of your project will be how you decide to create shade. Try to be as flexible as possible here. 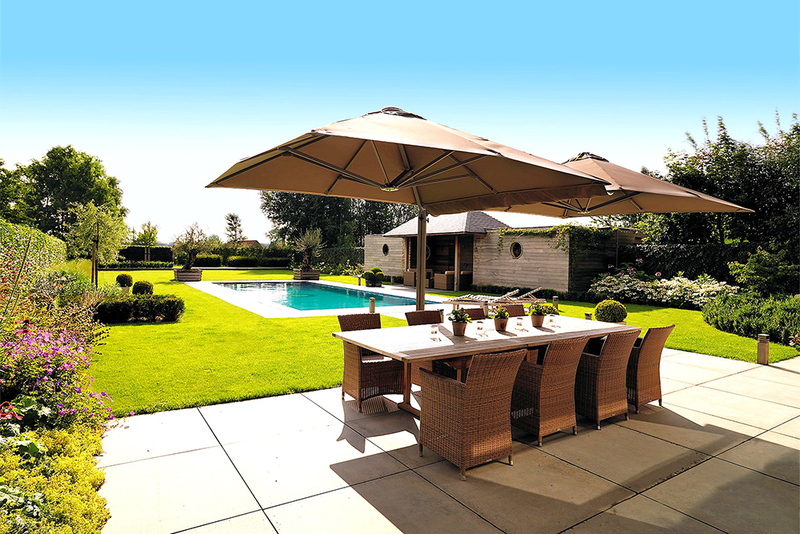 Outdoor umbrellas are a popular choice in this case, as they can fit to any scenario. If this process sounds daunting, then the expert opinion from a professional supplier will be a great help. When you're creating your dream outdoor space, you want to talk to someone who knows what's available on the market and can recommend the best solution for your needs.